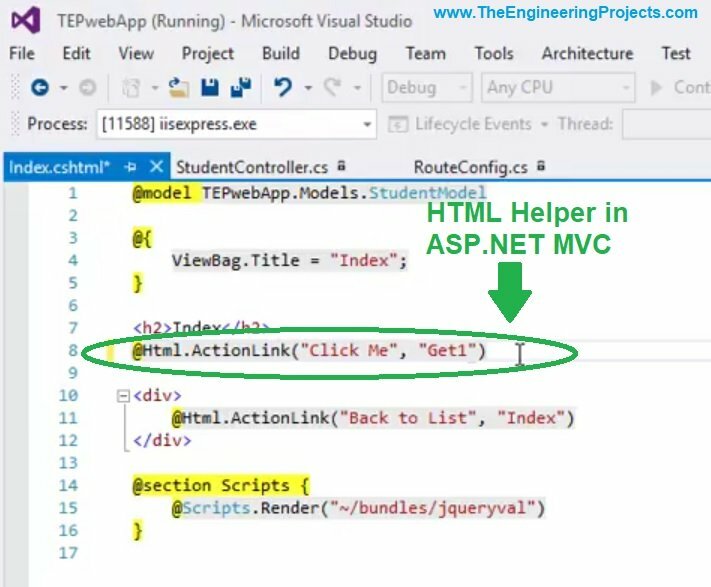 A complete step by step tutorial on HTML Helpers in ASP.NET MVC. Hello friends, I hope you all are doing great. In today’s tutorial, we are gonna have a look at HTML Helpers in ASP.NET MVC. It’s our 12th tutorial in ASP.NET MVC series. I know every tutorial is a new concept for you to understand but we have to cover all of them before starting working on our project in ASP.NET MVC. HTML Helpers are simple C# classes in ASP.NET MVC, which are used to create HTML components in the run time environment. HTML Helper creates a path for displaying model values (saved in SQL Databases) in respective HTML components e.g displaying name in Name Text Box. We can also get values from HTML components and then save them in our database via Model. You should recall Tut # 02: What is a Model ?. So, instead of drag and drop as in C# applications, in ASP.NET MVC we are generating and controlling our HTML components programmatically using HTML Helper classes. Html.TextBox Html.TextBoxFor It creates a Text Box. Html.TextArea Html.TextAreaFor It creates a Text Area. Html.CheckBox Html.CheckBoxFor It creates a Check Box. Html.RadioButton Html.RadioButtonFor Radio buttons are created using this HTML Helper. Html.DropDownList Html.DropDownListFor Drop Down List is created with it. Html.ListBox Html.ListBoxFor It is used to create Multi-select list box. Html.Hidden Html.HiddenFor Hidden fields are created with it. Password Html.PasswordFor Password text box are created with it. Html.Display Html.DisplayFor It creates Html text. Html.Label Html.LabelFor Labels are created here. Html.Editor Html.EditorFor Editor is created using it. Html.ActionLink It creates Anchor link. In normal HTML language, we use html tags e.g. <a> this html tag is used for linking, but in ASP.NET MVC we use HTML Helper and HTML Helper makes it too easy to bind model data with View design. For example, if we are working on simple html then we will use <a href="/Student/Click ME">Click ME</a> this code to create a link, but in HTML Helper it will be @Html.ActionLink("Click ME", "Click ME"). I have simply used Action Link, which will create a Link component and then I have given it a name and then action method. So, when you click on it then Click ME action method will be called. You can see in above figure that Link Helper has two inputs, the first one is the Anchor Text of the Link, while the second one is the action method which should be called i.e. Get1().